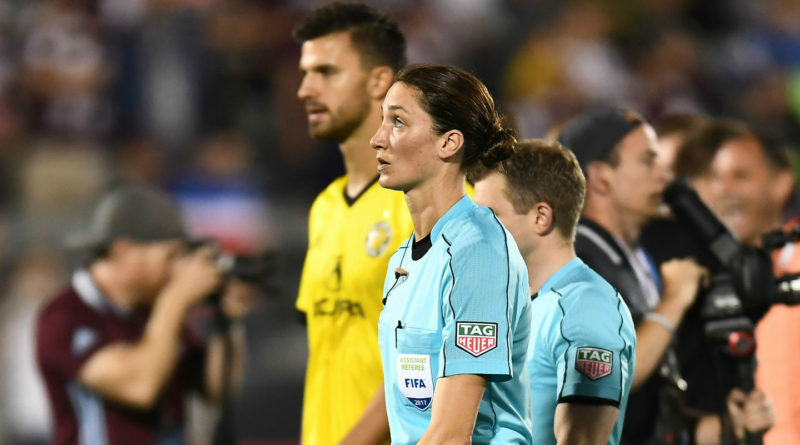 France may not be the most likely of locations for a PRO official, but that’s exactly where assistant referee Kathryn Nesbitt is aiming to be next summer. We’re not talking about a vacation either; quite the contrary. Nesbitt is targeting a place as a referee for the 2019 FIFA Women’s World Cup. The Baltimore-based official got her first taste of Major League Soccer back in 2015, and within two seasons she was breaking new ground when she became the first female official to run the line in a playoff match as Portland Timbers hosted Houston Dynamo in a Conference semifinal. Her constant hunger for improvement had already seen her involved in the FIFA U17 Women’s World Cup in 2016 – but now she wants the big one. Preceding that though, there are a significant amount of domestic responsibilities, and they are ones which she is hitting head-on. A rigorous preseason schedule was undertaken ahead of the big kickoff and she made her first outing of 2018 in Week 2, but for Nesbitt, the workload is welcome if her aspirations are to be fulfilled. Scrutiny and pouring over every facet of her role is something which is a necessity with the demands being placed on all match officials in the modern game. “I take preseason matches just as seriously [as the regular season],” she explained. “I want to mimic real-life games, to get me in the right mindset and to get my body used to making confident calls again. “I approach it like a normal game, with a couple of things in mind that I’m planning on working on this season. The items which I’m working on are a combination of initiatives which PRO have put out for us to focus on this year, alongside personal goals that I like to set; areas which I want to improve. “The game is always getting faster and players are getting better, so there’s always a place for you to improve as an official. Tournament experience is something which Nesbitt has no shortage of after she recently officiated at the CONCACAF Women’s U20 Championships which took place in Trinidad and Tobago at the beginning of the year. Analyzing that time, many positives were to be drawn from the experience. Officiating on the international scene sees PRO officials sharing ideas with referees from around the world. “That was an excellent tournament; I felt very fortunate to be able to attend. We had a couple of days of seminars while I was there and it was a great learning environment. After working side-by-side with fellow female officials aiming for the top, the trajectory of Nesbitt’s career is firmly in an upward direction. Being a young female official has not been without its challenges, though. Nesbitt started refereeing when she was a teenager and had to work harder to earn the respect of her peers, but she did so, and with it, worked her way up to become a professional. Now, she’d like to see more young women picking up the whistle, and had a message for those who might be tempted by it. “Refereeing is an amazing career to be involved in. You have the opportunity to constantly be inspired by the people around you, they all have such high aspirations. It’s a great opportunity to stay involved with soccer, to stay fit, and mix with people.